From the Doom and Gloom of injury to ‘Back On Track’ and Race fit! So since my ironman in early August I’ve had a fair few niggles and issues that were getting in the way of my training and prevented me from taking part in both the Helvelyn Triathlon and the Beachy head marathon. Things are now on the up…. My pelvis locking issue is well on the road to recovery after lots of physio and help with strengthening my glutes, helping them to fire more and also working on my lower abdominal strength. This issue is so common amongst endurance athletes and isn’t helped by the fact that I have a massive imbalance between my left and right hand side of my body. Apparently my right hamstring and quads are much more developed than my left hand side. This is most likely due to me favouring that side for years of kickboxing and downhill mountain biking. As part of the process of strengthening and keeping my body working properly I have also been advised to have regular sports massages concentrating on the areas that are tightening up because of these issues. 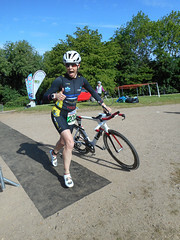 Through my triathlon club I became acquainted with the MD of a physio company called ‘Back on Track. Back on Track is a small team of chartered physiotherapists specialising in sports injuries and rehabilitation as well as occupational health and Ergonomics. Because the physio’s participate and compete in sports themselves they have a good understanding of the stresses and strains I place on my body and the effect that injury can have both physically and psychologically. Over recents months Claire has become a very good friend and as a fellow Ironman triathlete has very kindly offered to help me on my road to Kona by sponsoring my regular sports massage treatments and giving my regular advice and help with injury prevention and treatment. Because things have been looking up recently and my injuries seem to be well maintained I have decoded to enter a winter race. Always in search of a new PB I decided to enter Bedford Half Marathon in December. I’m pretty much guaranteed a PB here being as my last (and only) half marathon was the great north run aged 19, a lot heavier than I am now and with very little training – I’m hoping to take at least an hour of my time – now that will be a good PB!! Its only 8 months to go now until Austria IM and I also have my half IM in Majorca earlier in the season as a bit of a warm up. Sport pursuit has helped me so much with all my kit requirements for next year so I cant thank them enough for their help. I also pick up my next seasons race bike this weekend so I am very excited about that. All in all, looks like 2013 injuries and races are all behind me now and Im well and truly ‘back on track’ for a storming 2014! What this space for a race report after Bedford half in December! Team SportPursuit – The Ironman UK 2013 Story / SportPursuit | SportPursuit.com. Week 3 on team sport pursuit has been fairly uneventful – lots of training, lots of blisters on feet, no where near enough sleep and way too much eating out. I’ve been working in Scotland so had to link up training with my overnight stays. I discovered whilst staying next door to Edinburgh Zoo that the hotel pool was only 13m – not ideal for an hours interval set! That said the hotel staff pointed me in the direction of a local council pool which was 25m – it was a 3 mile run away so managed to use my laptop backpack to run there with swim kit, do my swim set, run back and still be in the restaurant for breakfast in time to meet my work colleagues. Got to say, the biggest problem with training is time and fitting it all in. This weekend was fairly intense too – over 8 hours of training and then my friend decided to take me for a ”little local walk’ with my dog – i didn’t realise this was a 2hr walk with a big hill on my already blistered feet just after my 17mile run…….the next day, he turned my planned training ride into a longer 72mile ride over 4hrs long, and me getting lost on the way home didn’t help! Welcome to my Blog. 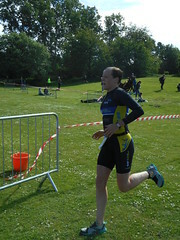 My aims are to blog on all my training activities to follow my journey in triathlon – from non-swimmer to Ironman triathlete. I have a dog called Chilli who acts as my training buddy for recovery runs and hill reps! None yet! First event will be the Wimbleball 70.3 later this month. Why do you want to be a part of the challenge? 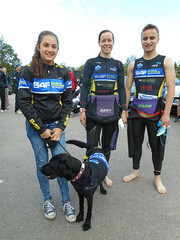 My Ironman plan was to do Austria in 2014 and just do a half this year, but training has gone so well and I have raced all the individual Ironman distances this year (first 3.8km swim in Coniston last weekend)! Your Ironman Bolton kit list? I haven’t planned this far ahead but it will definitely involve a lot of check lists being written. An ability to read minds – so I can tell if others were as smashed and in pain as me!